Hey, the great people at Marketing Profs have asked me to deliver some disruptive thoughts on how advertising and customer experience fit together. 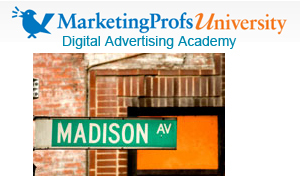 This online event takes place Tuesday, June 12, 2-3PM Eastern Time, and its part of MarketingProfs Digital Advertising Academy. This will be fun and a bit of a hat trick — because I’ve been following a number of companies that are gaining huge audiences with very little advertising. Instead, they gather customers and equip them with experiences and a value proposition that they enthusiastically spread. The Brands Whose Customers Tell the Best Stories Win. I recently read that the average American sees 90,000 paid ads a year. Now that number could be low or high, but one thing’s for sure: Few of us wish there were more ads, and most of us are great at ignoring those we see. It takes something really different to get our attention – the kind of experience that makes customers give a damn. Google, TedTalks, and Amazon are mass market successes because they nail customer experience. So do Apple, and Building 19. Nailing it isn’t about beauty or art – its about figuring out what it takes to delight buyers; and building the firm from the inside out around that.